Photo courtesy of Kevin Jimenez. 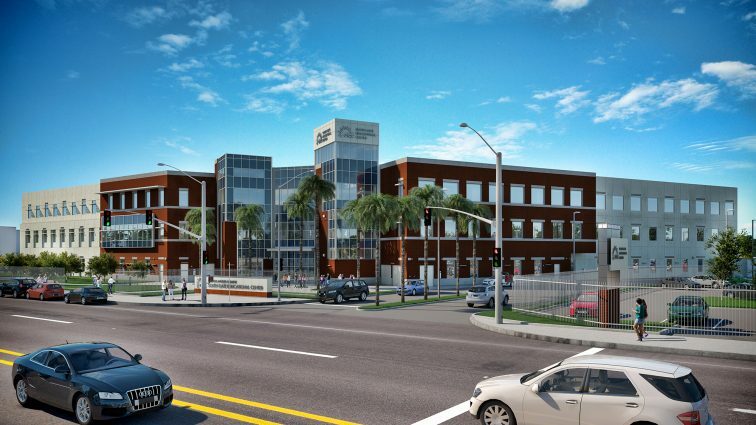 A groundbreaking ceremony on March 22 marked the beginning of work on East Los Angeles College’s new South Gate facility. The South Gate Educational Center is a satellite campus that offers some of the same classes offered at ELAC. Now with a brand new facility, the South Gate campus will be able to take more students in and offer a wider range of classes. ELAC President Marvin Martinez said that the South Gate campus was first established in the city of South Gate in 1997. It had previously been located in Huntington Park from about 1993 until the current South Gate campus was opened. In 2008 bond Measure J was passed giving 3.5 billion dollars to the community college system. A portion of this money was used by ELAC to purchase the land in South Gate across from the current South Gate campus. The property was originally a tire factory owned and operated by the Firestone company. 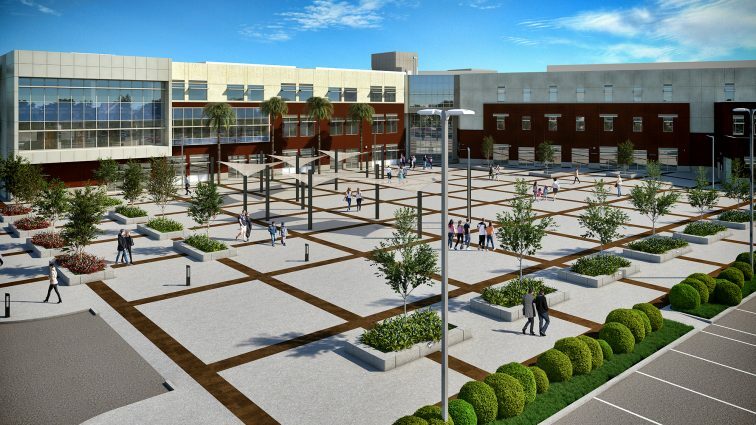 Martinez said that groundbreaking was specifically done to signal the beginning of the demolition efforts, and that by the end of construction the facility will double the size of the current South Gate campus. The press release says that the new facility will measure about 18.5 acres and is a 65 million dollar investment for the future of the local community. “It will have I believe 28 classrooms, labs, chemistry labs, physics labs. It will have a quad, it will be a state of the art campus with smart classrooms,” Martinez said. To fill the classrooms new teachers and staff will have to be hired. Martinez said that the building was built with enough space to accommodate future students. More students would mean more curriculum, which would mean hiring more teachers. Martinez said that the new campus is being built to give local students the chance to finish up certain classes that previously were only available on the main campus. He said that adding science labs will give Science, Technology, Engineering and Mathematics students the chance to finish their studies at this facility. He also said that local students will have a reprieve from having to drive in traffic to the main campus on a daily schedule. One of the deans at the South Gate campus, Dean Evelyn Escatiola said that the beginning of demolition is a very good sign for teachers and staff. Many have waited years to see this, and its arrival has given the staff a level of excitement. “We are excited about having modern classrooms, lecture halls, health center, gym and science labs, all of these additions will allow students to take all of their classes at the South Gate site if they want to. The new campus can only add to the community by providing credit and noncredit courses,” Escatiola said. She said that having the new facility will provide the college experience not only to the surrounding areas but to the South Gate community where it resides. South Gate mayor Belen Bernal said that the local community reaction has been positive, but that her office has seen through social media that there are concerns about the possibility of parking becoming a problem. Martinez said that the new campus will have roughly 1,700 parking spaces. He said that the forecasted 10,000 students that the new facility can hold will likely not all be there at the same time making the parking size adequate. Bernal said that by having the new campus in the city those that choose to attend and enhance themselves will provide an increase in economic development for the city. Martinez mentioned that having a larger number of students on campus will allow for an increase in businesses that would help with students needs. Shops like these would have a positive effect on the local communities’ economy. With the construction of a new facility an increase in student population at the South Gate campus is expected. Escatiola said that having the new campus is beneficial to the current students and to those that one day will become a part of the ELAC community. “The fact that there will be a college campus in the local community should raise expectations that going to college will be open to anyone who has the desire to take courses. The beauty of the community college is that everyone is welcome and that they will receive the assistance they need to succeed,” Escatiola said.